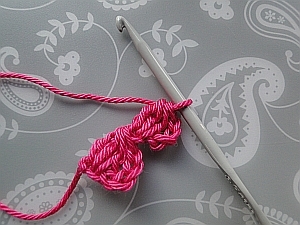 Let's start with what I call a "three stitch bobble" because you work into the chain (or another stitch) three times. 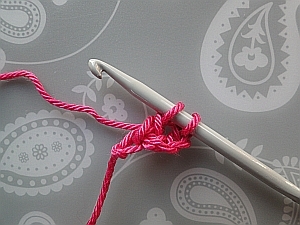 This is simple to work: ch 5, bobble into 5th ch from hook. Then repeat for as long as you want! 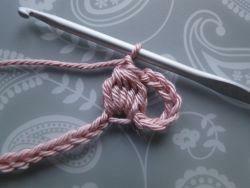 But how do you crochet a bobble? 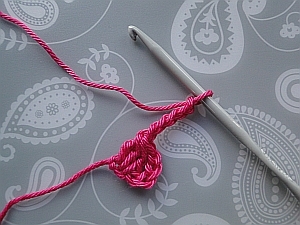 Step 1: ch 5; yarn round hook, hook into 5th chain from hook, pull through yarn. 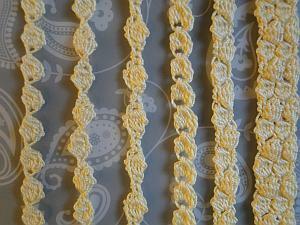 I insert my hook under the top two loops of the chain in this pattern. Working into 5th chain from hook. 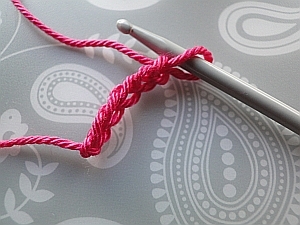 Step 6: Yarn round hook, pull through first two loops on hook. 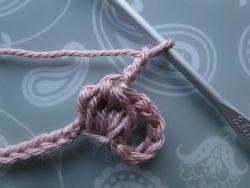 Step 7: Now hold your four loops nice and straight! There - a three stitch bobble! 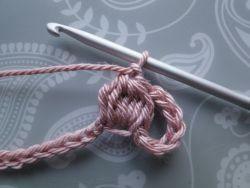 Now, some patterns will ask you to ch 1 to secure the bobble, others won't, depends on the pattern. 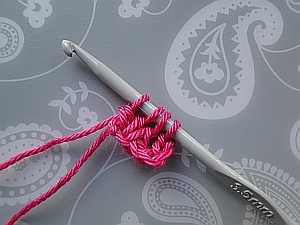 Next, we are going to make another bobble, and follow some written instructions! 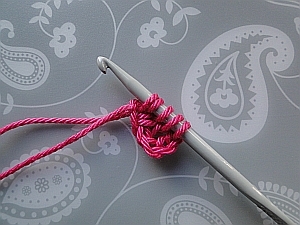 Step 9: Work another bobble in exactly the same way! 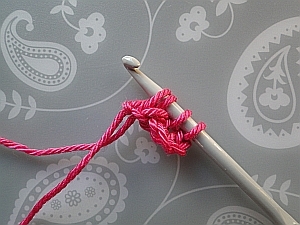 *Yarn round hook, insert hook into 5th ch from hook, yarn round hook again, pull through yarn. 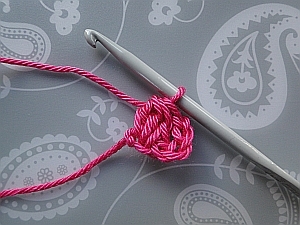 Continue making bobbles by chaining 5 and working a bobble into the 5th chain from your hook. 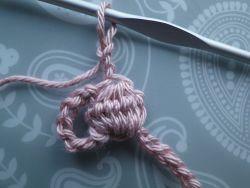 Bigger bobbles are great fun - the trick is not to work too tight. 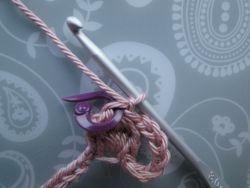 Keep your tension relaxed, or it becomes a fight between you and the yarn, and we don't want that! Five stitch bobble secured with 1 ch. 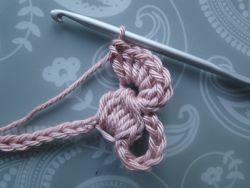 You simply work into the chain (or stitch) five times instead of three. 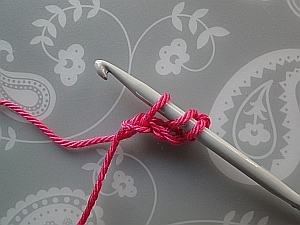 So: *Yarn round hook, insert hook into the chain or stitch, yarn round hook again, pull through. 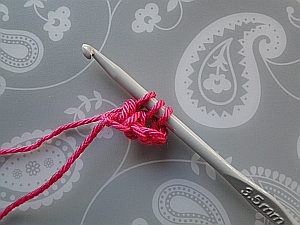 Seven stitch bobble secured with a ch. Working into the back of the chain that secures the bobble. 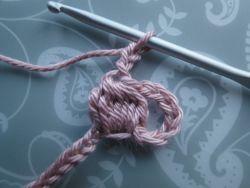 Sometimes I crochet into the back of the chain that may be worked to secure the bobble. Then I worked seven dc (UK tr) into the back of the chain. The back of the chain looks small at first, but work some stitches into it and it soon grows! 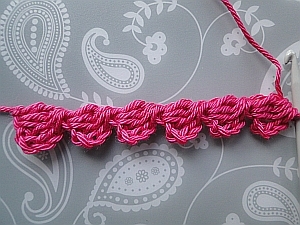 My heart garland pattern uses this technique.